What is rubber flex cable? Rubber flex cable can also be called elastomer cable. Rubber is a kind of insulation material for cable and wire. Probably rubber is the first type insulation in the world. 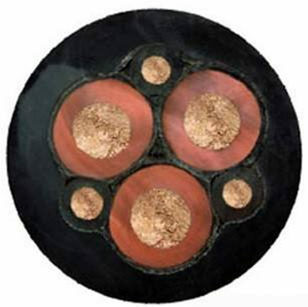 In the beginning, we used natural rubber to make the insulation and sheath of the cable. But later, all rubber insulated flexible cable manufacturers began to use synthetic rubber instead of natural rubber. If you want to by rubber insulated flexible cable recently, please message us. Huadong Cable Group is a professional rubber flex cable manufacturer in China. You can rest assured of our rubber coated flexible wire, both in terms of quality and rubber flex cable price. Just feel free to send your inquiry. East China takes every customer seriously. At the same time, we are committed to finding friends who can cooperate with us for a long time. Huadong Cable Group is a professional 3 core flex cable manufacturer in China. Here are the some advantages of our 3 core rubber flex cable factory. 1. Factory Supplier, High Quality and Competitive 3 core rubber flex cable Price ! 2. Over 20 years’ 3 core rubber flex cable manufacture experience and 15 years export experience ! 3. Flexible order quantity, Small or Big orders are all welcome ! 4. Design and Size can be customized, OEM/ODM is welcome ! 5. Excellent location: near by the Airport, Shipping Port and Zhengzhou Fair center ! 6. Fast sample time: we will send 3 core rubber flex cable free samples to you if you are ready to buy 3 core rubber flex cable from our company !
. Meanwhile, I’m sure you’ll like with our 4 core rubber flex cable and prices. We have 4 rubber flex cable workshops, each with a workshop area of about 10,000 square meters, 20 sets of advanced rubber cable production equipment, 20 high-tech engineers and 150 employees. Each production process is strictly inspected by our professional engineers. Starting custom your ideal rubber flex cable size, the factory price will send you within 12 hours. Testing: Huadong Group performs rigorous testing on every step of the rubber flex cable production process. Package & Delivery: Rubber flex cable package by iron or wooden drum or according to your requirement. Customer Case: Our rubber cable products have been exported to more than 30 countries, such as: Russian, America, Yemen, The Philippines, South America, North America, Middle East, Africa, Asia, Oceania countries and etc. Please kindly send us your inquiry cable list and order quantity, our sales team will send our offer documents to you within 12 hours.